Because of my general lack of time these days, I haven’t been in my kitchen in a week. The truth is, although I’d love to bring you recipes, I can’t bear myself to take pictures in the dark. Don’t worry! I can’t be away for too long. Baking and cooking is in my soul, it’s just what I do. Making pies for hunnys. I’ll be back soon with some sweet delights and healthy bites. I’ve also been working on developing a Pinterest site, a tailored newsletter for all of you, plus Valentine’s day goodies! Today, I’m having a guest blogger for the first time ever. 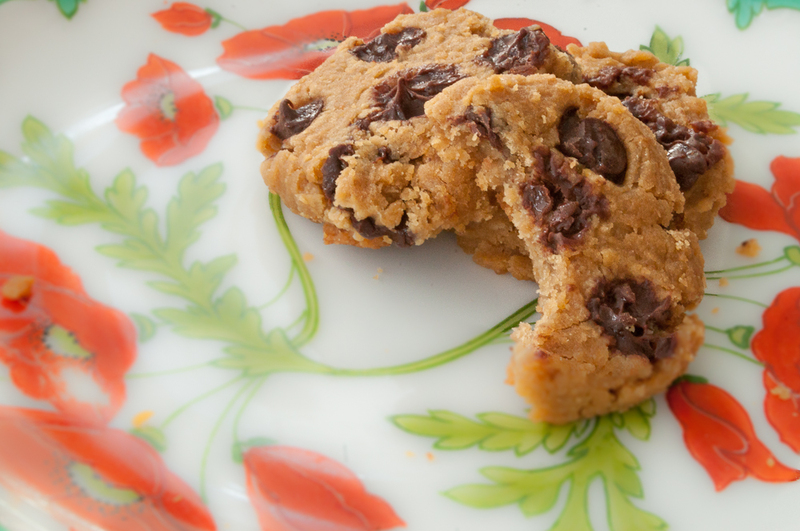 She made Chickpea Chocolate Chip Cookies. Crazy awesome, I know! I hope you enjoy her healthy recipe. Let’s talk about eating healthy. Well, I’ll be honest with you, it’s hard. Like really hard! It can be difficult even knowing where to begin. There are temptations everywhere you go! Especially when you’re waiting in line for your morning cup of joe at Starbucks. Next to the register awaits buttery banana walnut bread screaming to be paired with a salted caramel hot chocolate. I’m totally guilty! After munching on this, a headache and guilt ensues. My eyes were bigger than my stomach. Again. I’m here to tell you that eating healthy takes a lot of experimenting. Some days you’ll eat beautiful colorful salads, quinoa, and everything labeled organic and natural. Other days you’ll feel as though your car drove itself to the McDonald’s drive thru as you barely remember chomping on salty french fries. You’ll eat these Poptarts for breakfast simply because you love them. You’ll give yourself excuses too. Maybe your boyfriend and you broke up and you ate a pint of Ben and Jerry’s plus six chocolate chip cookies. (Okay you might have good reasoning here– that jerk)! Of course we all have that love/hate relationship with Chinese buffets. No matter what the case, we all have downfalls! Most of the time we feel regretful and guilty, but learning from those indulgences and moving on is the only thing you can do. While giving into your cravings is okay every once in a while, the trick is realizing that your body is happier eating eggs and oatmeal for breakfast. Chocolate chip muffins bigger than your face are awkward to eat and big no-nos. Oh, and that inhaling that box of Oreo cookies isn’t going to solve a crisis. Even though I really wish they would. But where do you begin with this health chaos you’re in? Someone once told me that they didn’t like banana bread. What? Everyone likes banana bread. I think I stared at them in shock for a good 10 minutes. Because if you don’t like bread, then how can we be friends? It’s the BEST bread on earth. The bread that makes you remember what it’s like to be a kid and eat massive amounts of sweets when your mom wasn’t looking. It’s moist. It’s heavenly. It’s awesome. It’s in your face. You know what else has been in my face a lot lately? Reality TV. Everytime I turn on the TV there it is. And you know what I think I secretly like it. It’s addicting. Don’t judge. In fact I kinda want to be Giuliana Rancic’s best friend. Mainly because I want to raid her closet. But she seems nice and fun. And I bet she likes bananas. I’m going to tweet her and find out. Ah the power of Twitter. 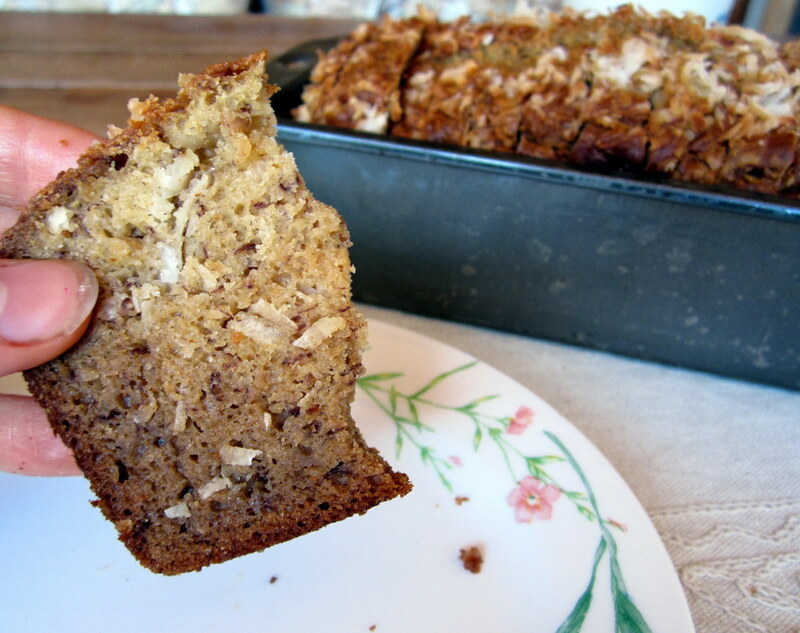 You can find out if people like banana bread. Maybe I should have defriended the person that didn’t like banana bread. Because that’s what you do these days. 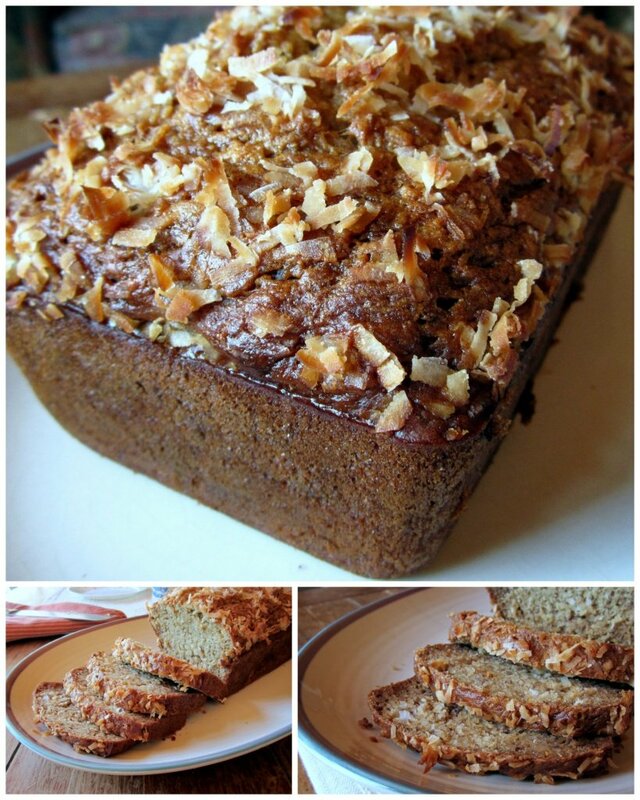 You go on Facebook and defriend the people who don’t like banana bread. Only kidding. That would be rude. But I am going to hug them next time I see them. They are missing out one of the best breakfasts in the world. That makes me sad. Okay but really, you want to know why this banana bread is so great? Because it has coconut in it. 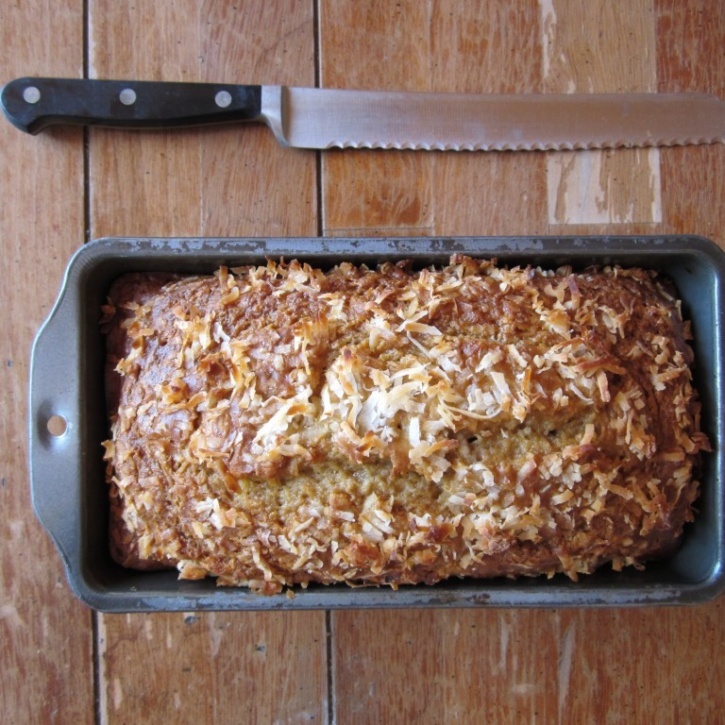 And toasted coconut on top. It also has greek yogurt in it. And a splash of orange juice. Plus it’s made with love. And because it will be your favorite breakfast ever. Oh, and did I mention it’s healthy? Yep that’s right. 115 calories per slice. Yes, I will repeat that for you. 115 calories per slice. I calculated it out just for you. Why is it healthy you ask? Because I use egg whites, greek yogurt, and minimal oil. It’s a lower fat, healthy option for you. The coconut provides some good fats though. It also provides a bomb of flavor goodness in your mouth. Moist, delicious tropical savory sweetness. Flavor bomb. Bomb diggity flavor. …Sorry, I’ll stop now. If you know of someone who doesn’t like banana bread, this will surely change their mind. 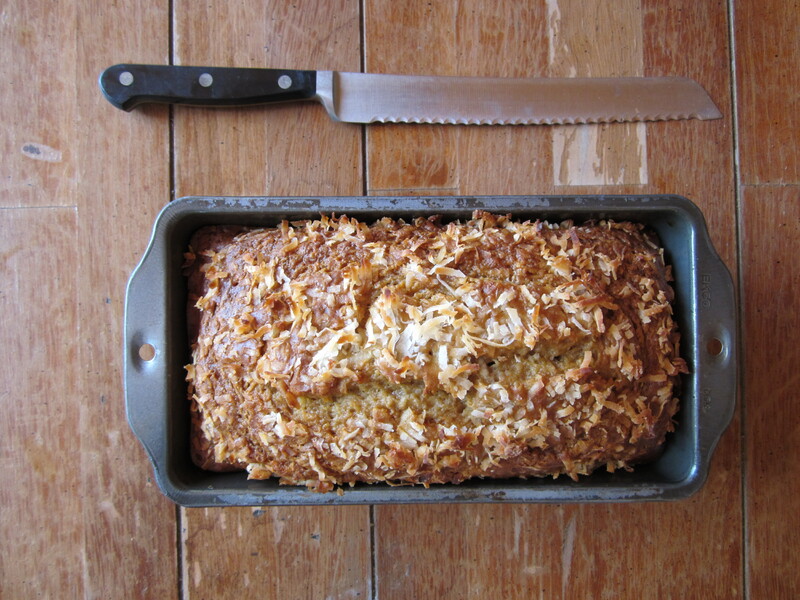 Healthy + coconut + banana = love. Have a slice or two for breakfast. Pack it for that 3pm snack. 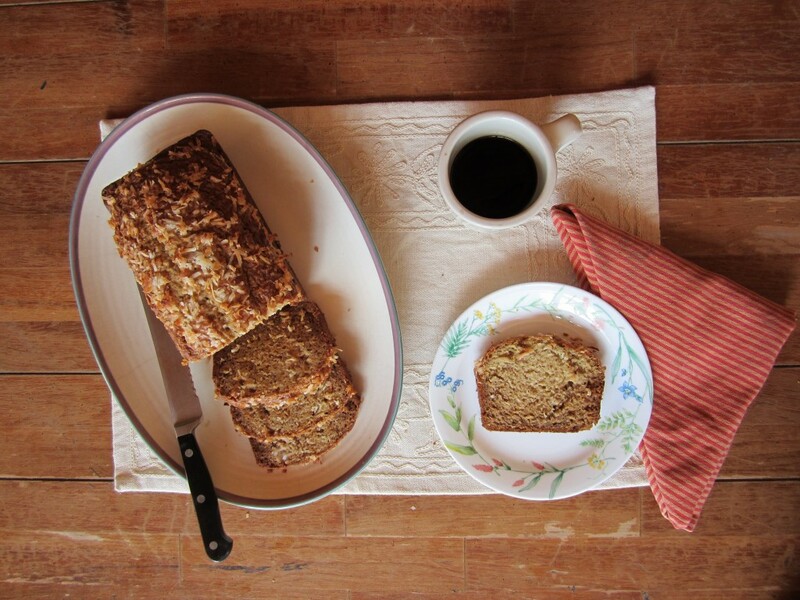 Make it for people who don’t like banana bread. Ps. Do you like when I post calories or healthy treats? Leave a comment, would love to know what you are looking for! 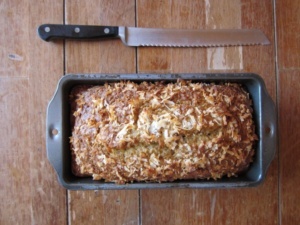 A healthy, low fat banana bread packed with coconut. Great for breakfast! 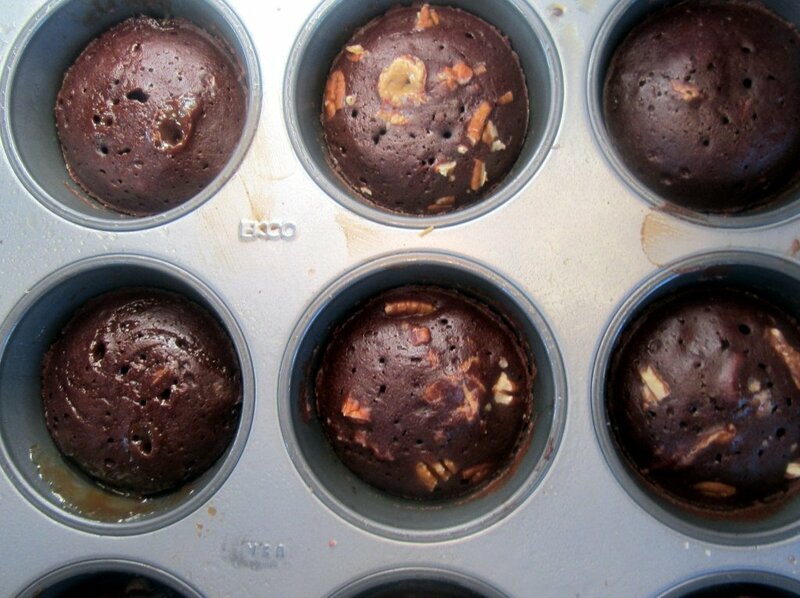 Mix flour, baking powder, baking soda together in mixing bowl. In separate large mixing bowl combine mashed bananas, brown sugar, and vanilla. 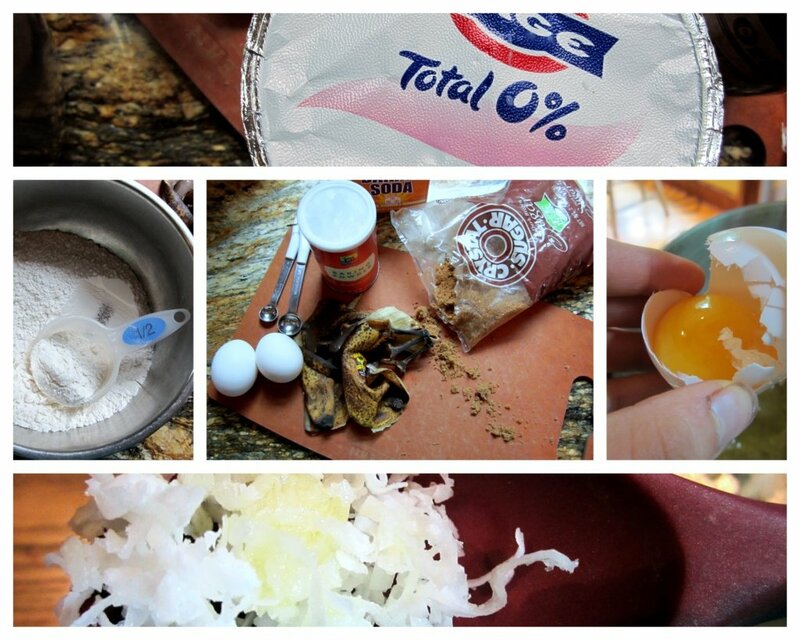 Add egg whites and mix together until smooth. Next add oil. Then, slowly add in flour and combine until moist. Next add greek yogurt and orange juice. Depending on the consistency you can add 2 tablespoons of skim milk. If you like your bread more dense than omit the milk, but if you like it more airy or lighter you can add it. Lastly fold in ½ cup of coconut into batter. Pour into greased 9x5 inch loaf pan. Sprinkle 2 tablespoons of coconut on top. Bake for 50-60 minutes or until toothpick comes out clean and the bread is golden brown. Optional: throw in ½ cup of walnuts to batter to help keep you satisfied all morning. 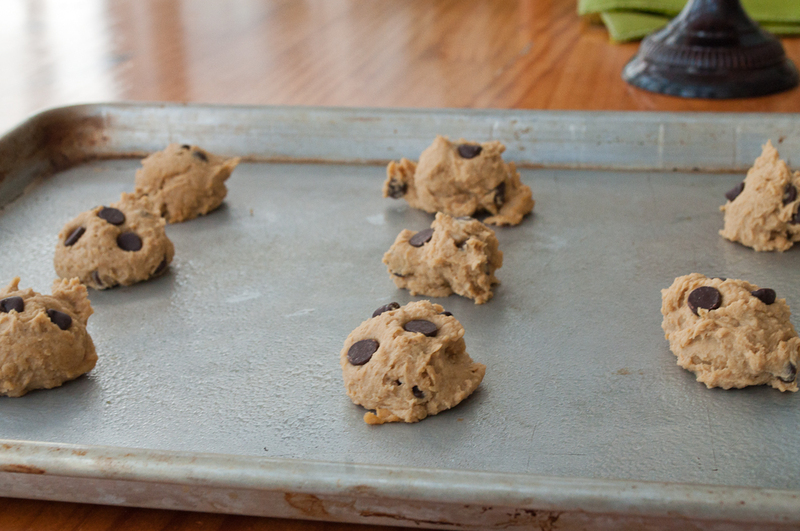 Another option: Substitute ½ cup of regular flour with whole wheat flour. Make 16 slices.